Can this 10.1" netbook swim in an already drowning netbook market? 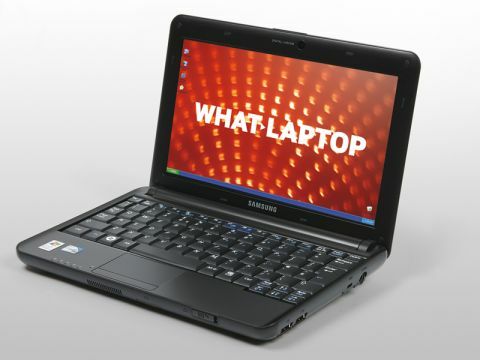 With its already comprehensive netbook range, Samsung's N130 enters an over-saturated market. Thankfully, great usability, a long battery life and low price help it to stand out from the crowd. Weighing 1.2kg, the smart chassis is slim and resilient. Matt-black plastics protect it from scuffs and scratches. The design lacks the flair of Samsung's N310, but suits home and business use. The sleek design is flawed slightly by the bulky 6-cell battery that protrudes from the base of the chassis. It lets you work for as much as 294 minutes when on the move, however, and raises the keyboard forward to a more natural typing position. Usability is excellent. All the keys are large with tapered edges, making them easy to access. They also move with a quiet and firm motion when typing. The 10.1-inch screen features a 16:9 widescreen aspect ratio, so movies are shown to their best potential. Brightness and contrast are poor, however, and while the matt finish eliminates reflections, it also results in fairly flat images. An integrated webcam is fitted above the screen, although the camera is slightly offset to the right-hand side, so your face does not naturally sit centrally when typing. This can be a bit off-putting. At this low price, it's nice to see that a one-year trial version of Microsoft Office software is included. Providing you with plenty of time to save up for the full version, it allows you to stay productive in the meantime, at no extra cost. Storage is average but capable, with a 160GB hard drive and a 3-in-1 card reader in place. Three USB ports let you connect peripherals, while 802.11n Wi-Fi provides high-speed wireless connectivity. While the N130 has no truly standout features, its great usability and battery life at such a low price mean that it betters many of its more expensive rivals. In a market where low prices are key and yet increasingly rare, this makes it a true breath of fresh air.